I haven’t till date met a single soul who doesn’t like wearing a saree. It is the most elegant, classy piece of clothing that can be worn a thousand different ways. If you have a wedding in the family, and want to know of some New Saree Styles, then this post will help you with fantastic inspirations. Whether it is peplum blouse, ruffles saree drapes, or long sleeves, there are so many New Saree Styles in the market now. In this post, I will share New Saree Styles for the bride, sister of the groom/bride, for the mother of the bride as well as for wedding guests. So you can pretty much find budget new saree styles, to some pretty premium high end purchases that you can do in the saree department. 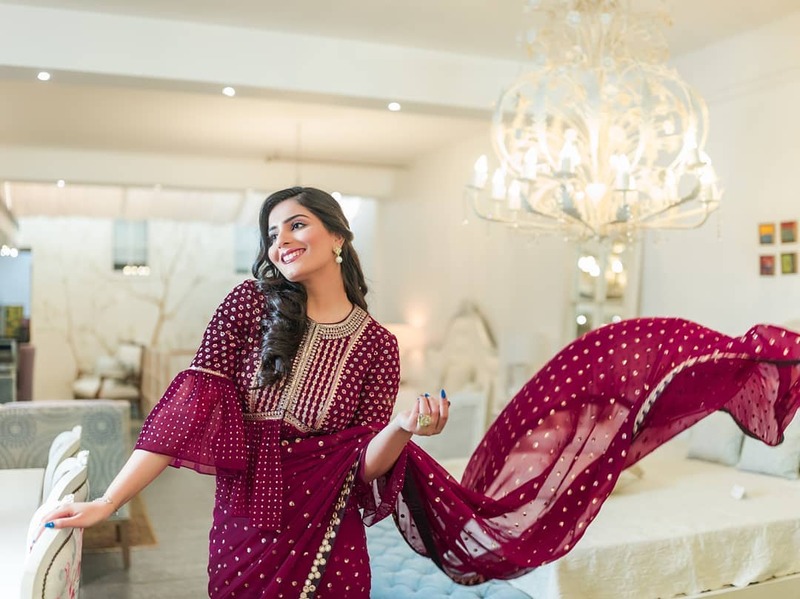 If your budget permits to spend on designer concept sarees, then I highly recommend Monisha Jaising for a cocktail outfit. Her sarees hug in all the right places, accentuating your curves. Most of her concept sarees have a heavy embellished blouse with full sleeves and cut outs on the side of the waist. They look amazing, and I have seen quite a few brides try out her styles for their sangeet and cocktail party. Whether you are the bride or the brides sisters, this is one style that is right at the top of my recommendation. If you want to look like a star for your wedding celebrations, this is worth looking at. The sarees are usually monotone colours, and the real change is the heaviness in the blouse designs. Depending on the saree style you choose, prices can vary anywhere from INR 1.5 Lakhs to INR 3 Lakhs for these. An ivory sheer tulle stitched saree in tulle base embellished with sequins and acrylic mirrors all over paired with a golden sequinned bralette and an organza draped sheer one shoulder jacket on top. Papa Don’t Preach has an amazing collection in mehendi and cocktail sarees. You will find everything from deep colours to candy colours in heavy sequins and high bling quotient. They are quintessential bridal picks to look like a dazzling diva during the wedding functions. Ruffle Sarees have been in trend for the past few months, and Arpita Mehta is the queen of this design. Her sarees are fun, not too over the top with simple saree and heavy blouse. You can see floral prints, monotone colours that are perfect to wear to any of the pre-wedding parties. These can also very well be worn on your besties wedding. I know not everyone wants to drop a lakh on a saree. So in case your budget is between INR 40k to INR 75k, you should check out Arpita Mehta’s collection. The simple ruffle sarees with basic blouse comes in the INR 40-50k price range. The others which are a little bit more heavy in design will be priced under a lakh. I assumed there is just this one Anushree Reddy saree. But turns out, Anushree Reddy’s latest 2018 collection has quite a few ruffles party sarees. They are all priced in the INR 60-70k price range. So in case you have a decently healthy budget, you can choose between this designer and Arpita Mehta’s ruffle sarees. Pink Floral Printed Saree – INR 2749 & Grey Ruffles Saree – INR 2834. Ok, so I know these two in no way match with the designer ruffle sarees. But hey, not all of us are ready to drop a five figure number on one single saree. Right? So here’s an affordable similar looking piece that you can turn into an expensive one by just switching the saree blouse. Don’t go for the same one. Instead get a custom one stitched by your local tailor. Totally doable, and shouldn’t cost you more than 5k including fabric + stitching. All of these sarees are from Anushree Reddy’s 2018 Lakme India Fashion Week looks. In case you’re interested in checking out grooms wear and lehengas, there are some pretty nice ones in the link. Do check it out. You know right, this saree can be a complete DIY project. The baby pink fabric can be bought along with the border from any local fabric stores in your city. Get the peplum embroidered top stitched and you’re done. The velvet jacket on the bottom, is I know a bit of stretch to do yourself. But the basic bits of the saree are sorted, and you don’t even have to pay truck loads of money to get it done. I came across this gorgeous fashion blogger Surbhi Sethi online on Instagram. Her website headtilt has some amazing Indian Wear and fusion modern Indian looks that I know so many of you will love. This particular look with the peplum blouse layered with a deep velvet jacket honestly is my favourite from this entire post. So wearable, and perfect for winter weddings. It looks classy, yet the baby pink saree brings the cuteness level right back up. I also came across this bonus saree look from her page which gives me that modern bahurani feel. Very playful, yet traditional. The saree is by Vani Vats. I did do a bit of stalking and the sarees are all priced under INR 50k. In fact, the designer has some really nice pre-wedding lehengas as well. You can shop them online on any of the premium e-commerce sites. This is my favourite bit. Although I don’t know if everyone can pull it off as good as the amazing fashion blogger Komal Pandey. All you need to remember is pick basic sarees. Chanderi silks, or plain georgettes in monotone shades and drape it in different ways. Ajio has some amazing sarees at affordable prices that you can play with in terms of draping styles. Which New Saree Styles was your favourite? Such a fantastic post it is!